There’s no such thing as perfect, that is what I had told myself for years in order to make myself feel better. Unfortunately, I didn’t believe it. I was a perfectionist, I wanted everything about myself to be perfect. Why? For acceptance, for love. For the reassurance it would give me in order to know that I am worth something versus being worthless and unlovable. 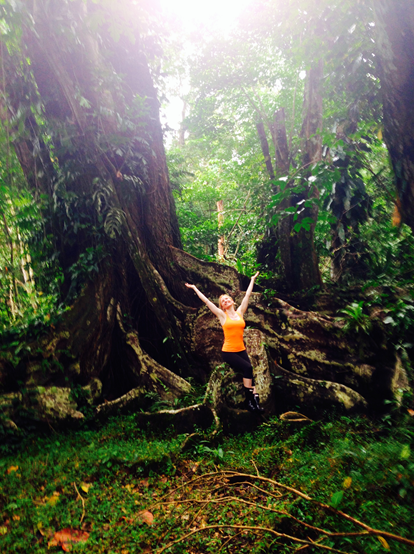 Recently I attended yoga teacher training in Costa Rica. Every day, we studied the yoga sutras. The sutras are ancient yogic texts written by Patañjali around 400CE. These sutras were written to be used as a guide for dedicated yoga practitioners to attain an enlightened state. One of the sutras alluded to a disciplined life bringing perfection and mastery of the body and senses. The use of the word “perfection” was debated. In the current day, we are pressured to have perfect looks, perfect body, perfect family, perfect career, perfect home. A picture perfect life is pushed on us from all angles in the media. Whereas many of the sutras held profound meaning for me, I struggled with those that alluded to perfection because I truly believed that perfection did not exist. In order to assess perfection, you must first compare. Comparison brings superiority and inferiority. If you look around at the people with whom you share this world, you will clearly see that every BODY is different. As you interact with the people who participate in your life, you will feel that every MIND is different. How then, is it possible for there to be such a thing as a perfect body or mind. When everybody and everything is unique, how can perfection exist and why should we strive to attain it? My quest for perfection had always proved fruitless. There was always someone smarter, someone prettier, someone stronger. My judgmental mind always showed me superiority and inferiority as I looked around. This proved to me that there was no such thing as perfection while also proving to be an obstacle standing in the way of my happiness and contentment. It was only on returning from my teacher training that I began to realize the true meaning of perfection. When you are harsh and judgmental with yourself and others, you are the obstacle that blocks your own potential for happiness and contentment. You are looking outwardly. When you stop comparing yourself to others and show compassion to yourself, you open the door to a new way of being. You have to accept yourself and then you can allow yourself to BE who you really are. To express yourself freely. You can live to your fullest potential, being true to yourself in your current reality. In doing this, you also stop being judgmental and harsh with the people you meet and accept them for who they are. You bring your attention back to you. Comparison is dropped. Only then can happiness flood your heart and contentment fill your soul. Only then can you realize that you ARE perfect exactly as you are. Being your true self every moment of every day is as perfect as it gets!